After your sojourn in Portofino, continue to dodge the pesky tourist crowds on the 18 km strip of unspoilt coast that makes up Cinque Terre. Carved into the rocky cliffs are five breathtaking villages, where clusters of colourful houses overlook gorgeous turquoise water. Circle the peninsula to visit the province of La Spezia, packed with hidden gems. Then head south to fabulous Naples and Capri. Get in touch with your Abberley charter broker by phone or email. We’ll arrange everything, so you can sit back and enjoy a perfect luxury yachting vacation. 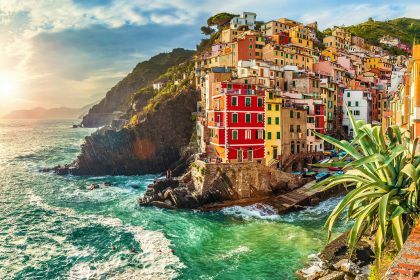 Cinque Terre, the famed five seaside villages on the Italian coastline, along with the Amalfi Coast, are high on the list of the best Italian yachting destinations. They are also conveniently located, just minutes away from the bigger hub of La Spezia. 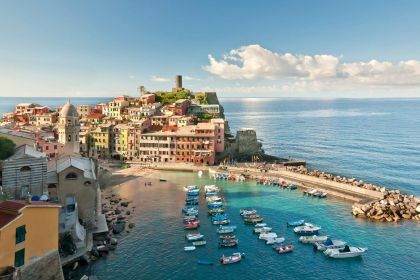 The southernmost of the five small towns is Riomaggiore, followed by Manarola, Corniglia, Vernazza and, finally, Monterosso al Mare. Cinque Terre is challenging to approach by car, so you either have to hike or reach the villages by sea. Conveniently, both options are available to you on a yachting vacation. The famous hiking trails offer a relatively easy but invigorating adventure and a lovely way to access the stunning views. Lovers’ Walk, or Via dell’Amore in Italian — trail No 2 in Cinque Terre — connects the southernmost villages of Riomaggiore and Manarola. It’s ideal for a leisurely stroll to stretch your legs or take a romantic wander with your significant other. If you are keen for more of a challenge, try the Beccara Trail, the 531, which also connects Riomaggiore and Manarola. However, whereas Lovers’ Walk more or less follows the coastline, the No 531 will have you climbing up and down steep cliffs. You’ll be rewarded, however, with breathtaking views and hedges of wild brambleberries and figs. Another drawcard of Cinque Terra is the area’s Sciacchetra dessert wine, certainly deserving of all its international accolades. This rare, ancient wine is native to the Cinque Terre region. Sip on it when you’re back home and not only will it make you recall your life-changing Italian yachting experience, but its taste will lure you back to explore the delights of Liguria. Monterosso al Mare is the largest of the Cinque Terra villages. 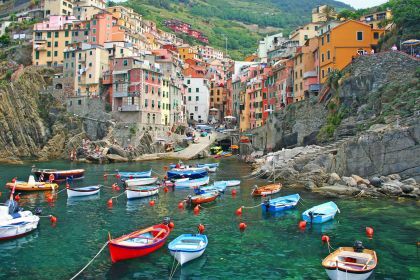 Among other attractions, it is famous for its Capuchin Friars Monastery, Borgo Antico, the medieval town, and Spiaggia di Fegina, the largest of the Cinque Terre beaches. You’re sure to enjoy the quaint shops and charming little restaurants. To really experience its authentic atmosphere, however, it is best to visit at night when all the day-trippers have left and you have more of the winding streets to yourself. 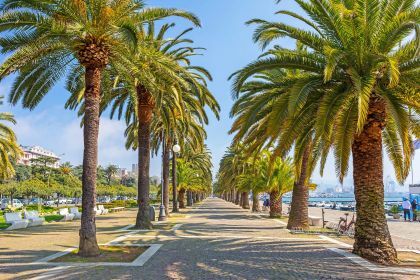 Most tourists use La Spezia, in the heart of the Liguria region of Italy, as a base for visiting the Cinque Terre but it’s worth spending a day wandering around the relaxed town and visiting some of its noteworthy sights. For boating enthusiasts, La Spezia’s nautical heritage is a major attraction. Among the nautical-themed sights is the naval museum, the Museo Tecnico Navale, close to the Naval Arsenal, which claims to be one of the best of its kind in the world — exhibits include a collection of ships’ figureheads. Other attractions worth visiting include the archaeological museum — exhibiting a fine collection of Roman and pre-Roman artefacts from the surrounding area; the Museo del Sigillo, the museum of seals, which consists of probably the largest formerly private collection of seals; the Museo Civico Amadeo Lia, a former monastery which now contains a donated art collection, including works by Titian and Bellini; Castello di San Giorgio (with its great view from the roof to the town, statues and artefacts of Roman period), and Lerici castle (across the bay from La Spezia). The wide seafront and strip of park along the esplanade provide an ideal opportunity for a relaxed stroll or a sit-down when you feel like escaping the tourist crowds. 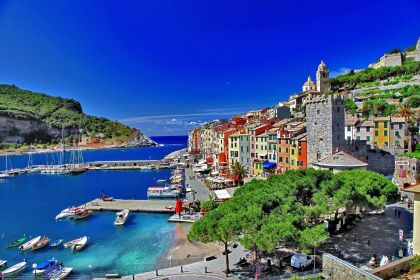 The nearby town of Porto Venere is also worth a visit if time permits. Built in the Middle Ages, its colourful waterfront buildings, steep cliffs and medieval streets and lanes are reminiscent of a film set. It was a favourite of English poet Lord Byron, who was seduced by its medieval charms. La Spezia is also the place to sample delectable Ligurian cuisine at its best. Try Il Ristorantino di Bayon, Osteria San Rocco and La Taverna Del Metallo in the atmospheric old town, for fine Italian food and wine, friendly service and deliciously sinful desserts. Invigorating yachting experiences, authentic cuisine, unique diving, natural wonders, enlightening cultural exchanges… they are all there for you in charming Portofino, Cinque Terre and La Spezia. Just get in touch with your Abberley charter broker by phone or email. We’ll arrange everything, so you can sit back and enjoy a perfect luxury yachting vacation on the Italian Coast.